Thanks for giving me the opportunity to explain what a virgin is to my 9 year old. huh? You have got to stop leaving us hanging!!! Burger King's new ad campaign is to take people from a third world country--Whopper Virgins--and feed them a whopper to see if they like it. Thanks for the comment explanation. I just thought you meant that the King must be a virgin. XD I mean, look at that guy! He's scary! Burger King has had the creepiest commercials for years now. 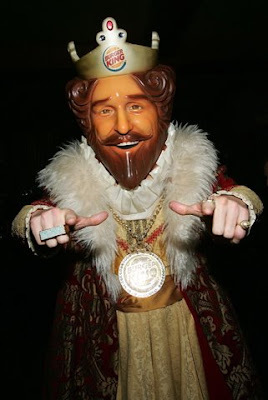 You know, I used to have a crush on the Burger King when I was a little kid. He was so handsome. (My dh has the same shade of red hair and brown eyes, too.) The big, plastic-headed version is scary.